Despite its modest setting, Tamaleria Azteca might forever change your relationship to corn husk-wrapped masa. 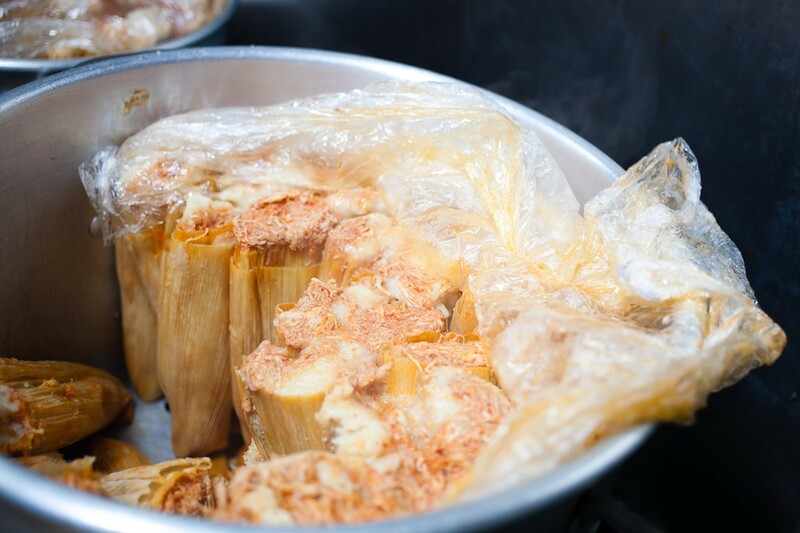 The tamales at Tamaleria Azteca will turn you into a tamal fanatic. Hours: Mon.–Sat. 11 a.m–6 p.m. I have a soft spot for restaurants that can nonchalantly slip themselves into my life without fanfare, and Tamaleria Azteca is one of those places. A no-frills take-out window with killer tamales on a residential corner of Market and 60th streets in Oakland, there's nothing about the place that requires I stand on ceremony. I can shuffle there in my outdoor slippers, ring the little brass temple bell hanging from the sill, quietly pick up my order, and shuffle back home. When it's raining, an umbrella over the counter becomes the sole, occasional decor, except for the restaurant's two signs — one with its current name, and another for its former incarnation, Tamaleria Unicos de Cuernevaca. The name changed when the original owner retired and went back to Mexico, and her son, Sergio Gomez, picked up the tamal mantle. But the old "Unicos" sign is still up, perhaps to maintain the restaurant's connection to Gomez's mother, whose tamales had a fiercely enthusiastic following. Or perhaps they never bothered getting rid of the old sign because — to our good fortune — the restaurant's priorities skew deeply toward the quality of the food and away from cosmetic concerns. 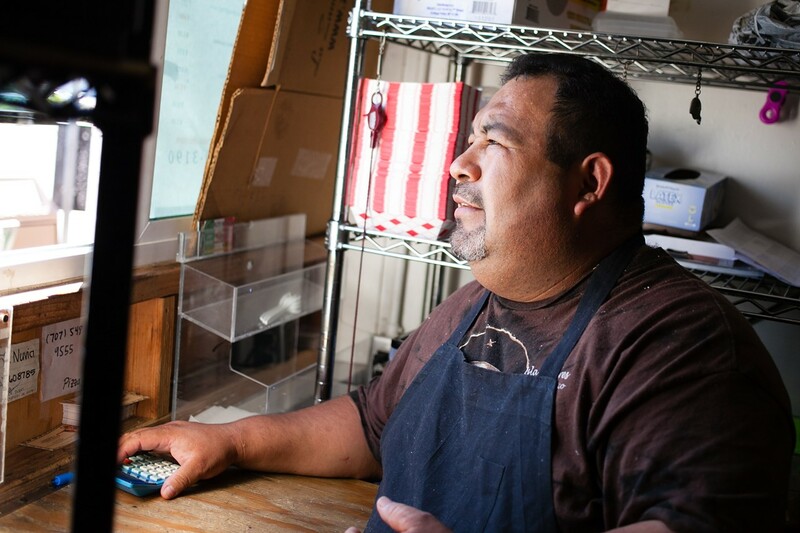 Gomez told me that his mother would say her tamales were "nothing fancy, just made with love." In my case, that love has turned, unexpectedly, into an intense affair. I never used to be a tamal person, the way some people aren't bagel people or don't like the Beatles. Tamales and I had a cordial but distant relationship, and I'd eat them willingly when they were offered — that is, until Tamaleria Azteca turned my head. Gomez's tamales come sodden and steamed in a paper jacket and then wrapped again in a plastic catch-all that is, in this case, fairly necessary. Texture is the thing here. The masa is consistently fluffy, light, and smooth, with the ridges of the corn husks creating indentations in the pale masa that feels silky on the tongue. Not a half-centimeter of these tamales can be accused of dryness or mealiness, and the masa is savory and flavorful, at times pudding-like. It is masa to make one smile. Inside is a filling that's been abidingly tender on every occasion I've visited. For his meat tamales, Gomez uses lard, skillfully and with abandon. The chicken filling is faintly sweet with tomato but also treacherous. The chilies used in it are unapologetically, staunchly, forthrightly hot — chiles japones, which score an eight or nine on a ten-point scale of heat. After a tiny time lapse of a few seconds, the chili's needle-thin jabs of heat deliver a tingling pain. It goes similarly with the vegetable tamal (made with carrot and potato) and the pork tamal. The fillings tingle, almost coyly, considering that they're positioned in such a sweet, cushy bed of masa. The green tomatillo salsa does something to soothe the tongue with its limey tartness, but it only provides some relief. 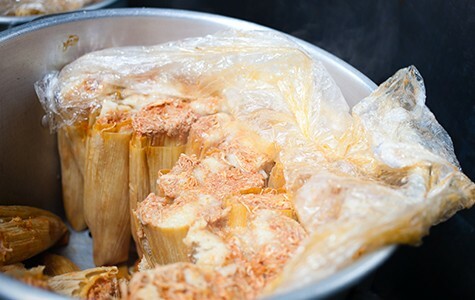 For diners who eschew heat, or would at least prefer to dole it out themselves, I'd steer clear of the meat options and head toward the lard-free tamales filled with cheese and sweet-roasted chilies. Get the salsa roja, also Satanically hot, to go with these, and doctor up your tamal as you prefer. The sweet tamales are also good — made with sugar, they have a slight caramel flavor. Azteca has changed its menu since its Unicos days to add some hearty Mexican standards made with careful attention, individuality, and more than a little soul. The street tacos are a particular favorite of mine — meaty, spicy whoppers, heaped to overflowing, with broth and salsa soaking into the tortillas and wetting my hands. The flautas are crisp, topped with fresh lettuce, thin slices of ripe avocado, a drizzle of crema, and snowy, creamy Cotija. You can get these — or the tamales — as part of a platter with refried beans (whipped to silk and heavily imbued with toasty pork flavor) and rice that's plump, non-greasy, and just salty enough. Chips aren't on the stated menu, but you can ask for them. They are more than decent — warm, light, and made on the premises. The restaurant can take on all of my Mexican food needs handily, though I have had a few disappointments. My enchilada orders were cool to the touch under their blanket of crema both times I arrived home with them. The tortilla chips, delicate as they are, sometimes break in the process of scooping up chunks of chicken from a burrito — and that burrito tends to be more abundant in stew than rice and is therefore a touch squishier than I'm used to. And I didn't particularly care for Azteca's torta, which has changed since its Unicos days, when it was grilled on both sides and stuffed with beef and a melted slice of American cheese. Nowadays, the roll is cold and ungrilled, and though I found no fault in the filling — pan-fried marinated pork with lovely, chewy, crispy bits; mashed avocado; cream cheese; and a layer of sliced, seeded, and roasted chilies — I do prefer my tortas to be a tad warmer. Minor glitches and personal preferences aside, nothing's been lacking in flavor. As squishy as the chicken burrito might be, when I eat it I feel like I'm sinking my face into a gorgeous, complex stew. Service is friendly and a trifle relaxed, and I find it's best to come patient and ready to adapt, as the tamales, time-consuming as they are to make, are available willy-nilly. There isn't a schedule, and sometimes the tamaleria is just plain sold out. Pork and chicken might be on offer today, while vegetarian tamales may be all that's on for tomorrow. If you're dead set on a specific tamal, I recommend sending a text message to the restaurant's phone number (which is just Gomez's cellphone) to ask what's available before coming. Lightly staffed as the restaurant tends to be on weekdays, I've sometimes found that I have to prod a bit to make sure my enchiladas were made with chicken, not cheese, or that I was indeed coming away with the chips I'd ordered. Such quirks are easily forgiven: They're as human as the food, which brims with soul. And the tamales are worth going out of your way for. At once soothing and wickedly hot, they are worth your patience. So minor is any inconvenience, the memory of it disappears the moment the waiting stops and the eating begins.